HALLIE EPHRON: Earlier this week, there was a little kerfuffle in the COMMENTS department over what's meant by literary executor. Our friend and frequent commenter Ellen Kozak pointed out: "There is (in most states) no such thing as a literary executor. Not a term that is recognized-- and most lawyers who draft wills know nothing about copyrights and have no idea how to work around that myth." Ellen, is a Milwaukee copyright, publishing and media lawyer. She is also the author of, among other things, Every Writer’s Guide to Copyright and Publishing Law. Like me, she graduated from Barnard College and is a Star Trek fan, as an aside. She told me a sad story about a friend of hers, Miriam (not her real name), who 30 years ago sold a novel for $20K to a major publisher. It got to the copyedit stage... and they delayed the pub date. And delayed it. So her agent at the time took it back. Over the years, Ellen would say, "Miriam, let us sell it for you" and Miriam would say, "No, I'd have to give the money back." Ellen could not convince her that the publisher would be so thrilled to get anything that they would probably settle for "first monies" which means the advance from the second publisher, even if it was less than they'd already paid-- indeed they might even have convinced new staff at the first publisher to bring it out. Sad ending: Miriam got Alzheimer's, and was a hoarder, and they tore down the building next to hers and mice got into her place as a result. Friends went through her place and couldn't find the manuscript. It probably got chewed up and/or thrown away. Such a shame. The moral is... what? I invited Ellen back to explain what exactly we writers should do protect our published and unpublished works. Ellen? (2) If any of your contracts are still in force (not reverted), make sure the person who will be going through them knows where they are. He/she can always take them to a lawyer. A folder full of copies of contracts, with the agent's name and contact information (unless you outlive your agent), and maybe a master list at the front of the folder? (And when I say folder, I mean real, not virtual). (3) FIND and perhaps establish a relationship with or at least have a list (yep, again) of names of lawyers/agents the people who will be looking out for your stuff can go to: a list of lawyers who do copyright and publishing law, either in your area or elsewhere (copyright is federal, and the publishing lawyer can work with your local estate lawyer). (4) MAKE LISTS OF YOUR FAMILY/HEIRS. Even if your long-time agent (as in Lorrie's case) is willing to handle your literary estate, how the hell is he/she supposed to know who your relatives are? And which is the one you do NOT want to be anywhere near your work? I guess it boils down to MAKE LISTS and LABEL THINGS. HALLIE: Check! Ellen will be stopping by today, so if you have questions, fire away! This is your chance!! Ah, so nice to meet other Star Trek fans . . . .
How sad about Miriam . . . guess we should all be making lists and labels . . . .
We do have copyright protection, though it doesn't last forever. The Copyright Act of 1976 gives us protection for: life of the author, plus 70 years. Nancy, there is so much more to copyright than just the current duration (which I did mention). There is the termination right, for example, which allows certain persons (the author, his/her surviving spouse, children, and/or grandchildren) to terminate a grant (e.g., book contract) after 35 years. This right cannot be assigned, although copyrights themselves can be transferred by will or intestate succession. Copyrights can be divided infinitely-- not only shared by more than one owner, but also divided by territory, medium, type of use-- or even language (although a translation is classed as a derivative work). Most estate lawyers have no idea how to treat an intangible asset like this, and should work with someone who does. Thanks,Lorrie, for the warning. Something else to put on my list of important things to take care of. Tangentially--is it true that when a person dies, all their Kindle books disappear unless someone else has the password? Given royalties can continue long, long after the author's death, how do publishers deal with a perhaps escalating number of beneficiaries as ones heirs die and leave their own set of heirs? Interesting stuff. Good thing I like making lists! So interesting, thanks for explaining these twisty concepts to us Ellen! and thanks Hallie, for bringing her back. This is so complex--because your heirs might not be the people who would be interested in your books. And what if you feel you're not worth much now--who knows what the future brings? Yikes, I'm off to make some lists! Hank, I don't know anything about Kindle-- I don't have one, so I've never even read a downloaded book (I like paper). Jim, if you have a corporate agent (as opposed to one who could drop dead), the checks will be paid to your agent who can be advised as to how to distribute royalties to your heirs. (By the way, most agency contracts specify that the agent gets a percentage of all royalties and sub rights-- like movie-- sales for the duration. So if the agent is a solo and is dead, that could pose a problem, and there should probably be provisions for this in your agency contract). A trust could be a good idea for a number of reasons. I suggested this yesterday in my discussion with Hallie, because in most states, the executor (now usually called a "personal representative") is discharged when the estate is settled. The only way for a "literary executor" to have any authority is for him/her to be the trustee of a trust containing and administering your literary works. When you get to the point of creating such a trust, you are going to have a problem with most estate lawyers, who will not have any idea of the complications of rights sales etc., so the estate planning attorney should work with a copyright attorney, preferably one who understands the publishing world. The powers granted to the trustee of a literary trust could be very different from those enumerated in the generic language of the trust, and you might want to address them specifically. It is more than a matter of paying out the royalties. It has to do with bringing out your reverted book as a self-published (by the trust) paper or electronic edition; with selling derivative rights for a movie and/or a sequel/prequel by a fan; with control over where your series goes when you can no longer write it. And your brother-in-law the personal injury lawyer probably doesn't have a clue about any of this. Ellen, thank you for sharing this information. I took law classes at a law school and unfortunately, they did not offer copyright law classes. I would have loved to take a class if offered. and they offer property law spordially. Are there good copyright law classes offered online? Kindle... AND I think anything you have in iTunes, if you die with the password I think Pooof. OH, this stuff overwhelms me. I'm so glad to read it though and at least to start thinking about it. I'm going to print out this post. Great information for authors and for the rest of us, too. I'm a list maker, and I have essential information, such as life insurance policies and passwords down on paper. I know some people think it morbid of me, but I even make lists of my accounts payable to go with the other lists when I take a trip. To the person who asked about copyright law classes, they didn't offer copyright when I was in law school, except as single week of the patent and trademark law course, which only the guys with an engineering background took. 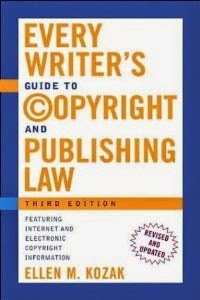 So I knew nothing about copyrights until I was 9 years out of law school, and had decided to quit lawyering and be a writer. We have mandatory continuing ed if we want to keep our law licenses, and they offered an all-day continuing ed class in the (then) new copyright law, taught by Marybeth Peters (who became Register of Copyright), so I took it for my own protection. Long story short, because I brought knowledge (of contracts and publishing custom and fandom) to the mix, I got a lot more out of the class than most people did. And I started to read up on it, and learned more. And then NYU offered a one-time post doc course in Law of the Media which I took (from Alan Latman, the head of the Copyright Society) so I now have a Certificate in Law of the Media from NYU. I also attended several one- and two-day courses (very expensive) from the Practicing Law Institute in publishing law, entertainment law, etc. And I got to the point of expertise where I was invited to GIVE programs like that myself (among other places, at the American Bar Association annual convention and in a traveling seminar in sports, entertainment and publishing law sponsored by the University of Houston Law Foundation). I have also spoken at publishers' and writers' and bar conferences around the country (and I'm still available!) I discovered that the more I used the copyright law (for strange cases, or to review hundreds of variations on publishing contracts, or to answer questions from the audience at a presentation) the more I learned about it. Needless to say, I did not quit being a lawyer in 1978, but I did start writing (and selling) both fiction and nonfiction, and of course, my own experience added to what I knew about the subject. So-- where can you get this kind of information? Law school, continuing education programs for lawyers, a course that was never offered again at NYU because Alan got liver cancer and died quite young (and is sorely missed), and a lot of experience in dealing with problem cases. Anyway, that's how I got my expertise. There may be other routes, but I only know mine. A few years ago, one of my writing instructors died of heart disease while she was completing her book-of-the-heart, a non-fiction guide on helping the bereaved. Other writer friends helped her finish and meet her contract, so the book was published after her death. I volunteered to pitch in with promotion. One of our biggest stumbling blocks was no access to her author website. We couldn't update the site with her new title nor the cover of her latest book, the book that meant so much to her, because we didn't have the passwords. Wow! Ellen, this is fascinating! I'm going to print a copy of this and put it in my very old fashioned metal file cabinet. I think your list can be used for lots of things. So glad I stopped by. Thanks, Hallie. Great blog!